Contact Anantara Hua Hin Resort. Explore seaside charms in a royal coastal retreat. Leisure, pleasure and culture await only a few hours drive from Bangkok at our opulent resort in Hua Hin. An easy drive from Bangkok, Anantara Hua Hin takes about three hours to reach via Phetkasem Road. For a scenic and relaxing journey, take the train from Bang Sue Station in Bangkok, with departures twice daily. The journey takes around four hours, and the resort is only six kilometres from Hua Hin Railway Station. 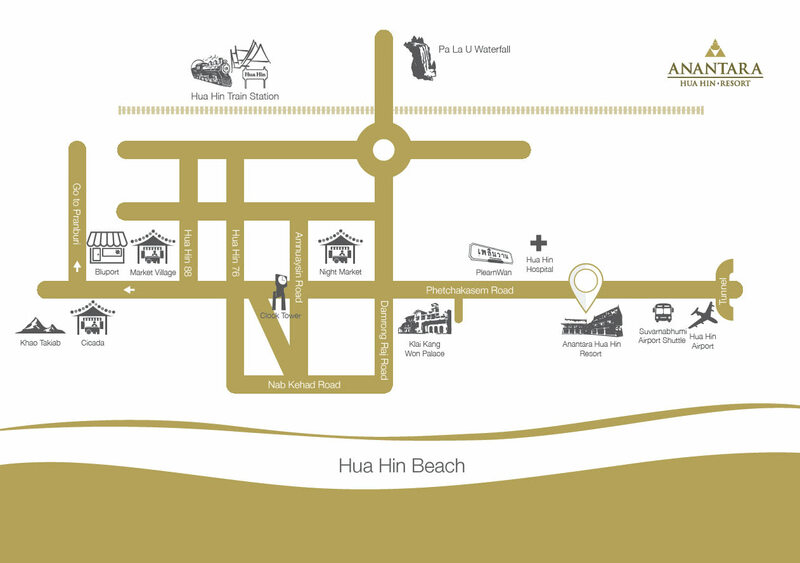 Hua Hin Airport is only a two-minute drive from the resort. Private planes can be chartered. Most international travellers fly into Bangkok, reaching the resort with a three-hour chauffeured drive which we are happy to arrange.